Shortly after 7pm, the first batch of newcomers went out on their controlled lap. Conditions were perfect with competitors greeted by clear blue skies and warm sun although riders were also made aware of melting and running tar at Guthrie’s. 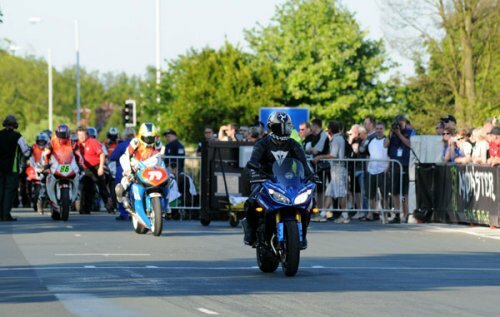 Rider Liaison Officer Richard Quayle led them off the line accompanied by Jimmy Storrar, Karl Harris and Lee Johnston and he was followed by retired TT racer Keith Amor who escorted John Ingram, Jamie Hamilton, Michael Niblett and Gary Graves. Second rider liaison officer Johnny Barton was in the final group with Adam Child, German Stefan Holtz and Graham English. “I wasn’t as nervous as I thought but it’s totally different on a bike to the laps I’ve been doing in a car – I kept expecting cars to be coming the other way!” Johnston was even more vocal, simply saying “that shouldn’t be allowed, it was absolutely awesome!” The riders were keen to get straight back out and get their first lap on their own rather than at a controlled speed. Fifteen minutes into the newcomers lap, the Lightweight machines took to the Mountain Course at 7.15pm with John Burrows, Ian Pattinson, James Hillier, Nuno Caetano, Cameron Donald, Stephen Thompson, Ryan Farquhar, Ivan Lintin, William Dunlop and Roger Maher the first riders away. Team-mates Paul Shoesmith and Simon Andrews got their first lap of 2012 underway mid-way through the pack whilst Davy Morgan, Dan Kneen and Olie Linsdell were amongst the last riders to leave the line, the latter making a welcome return to racing on the Island after his crash at the 2010 Manx Grand Prix. With interest in the race increasing all the time, many were wondering what lap times the 650cc machines would be capable of and, with Hillier going through the Sulby speed trap at 146.2mph, it was Farquhar who, perhaps unsurprisingly, had the honour of completing the opening lap at an impressive 113.359mph. Archibald, Hillier and Donald were also over the 110mph mark at 110.936, 110.754 and 110.511 respectively. Donald called in to the pits to make alterations but Farquhar pressed on and increased his lap speed slightly to 113.587mph, Hillier doing the same at 110.866mph. Archibald got closest to Farquhar with a lap of 112.925mph whilst Donald and William Dunlop also impressed at 112.035 and 111.139. Meanwhile, Hamilton was the quickest of the newcomers at 106.015 followed by Niblett at 104.120 and Johnston at 103.831, ex-BSB star Harris lapping at 99.620. Due to the time lost at the beginning of the session, the Lightweight machines were out on track for 40 minutes rather than the scheduled 60. 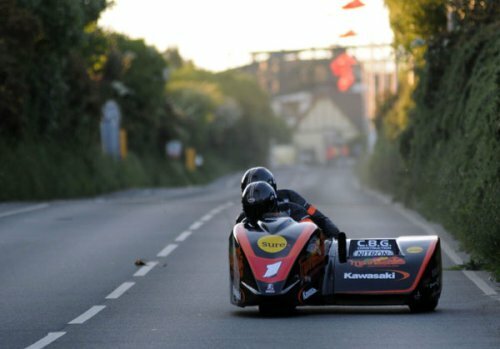 At 8.00pm, it was the turn of the F2 sidecars and John Holden/Andy Winkle led the newcomers around, amongst them Deborah Barron/Robert Lunt, Stephen Ramsden/John McWhir and Pete Alton/Keith Brotherton, the latter two just having passenger debutantes. Twenty minutes later and it was the turn of the established runners with the returning Dave Molyneux/Patrick Farrance first to head down Bray Hill closely followed by Tim Reeves/Dipash Chauhan, Gary Bryan/Gary Partridge, Ben and Tom Birchall, Conrad Harrison/Mike Aylott and Carl Fenwick/Mark Sayers. Molyneux, back racing at the TT after a year’s lay off, was quickest with a lap of 110.831 followed by Harrison (108.364), Bryan (107.439), Reeves (107.259) and Birchall (106.653). Monday’s session will see the Supersport, Superstock and Superbikes take to the course with seventeen time TT race winner John McGuinness, Guy Martin, Gary Johnson, Ian Lougher, Michael Rutter, Ian Hutchinson, Conor Cummins and Bruce Anstey all taking to the track for the first time. The session is due to get away at 18.20. Ryan Farquhar on the KMR Kawasaki and Dave Molyneux/Patrick Farrance on their first lap.